The weather was really good yesterday so we went for lunch to a hotdog stand called Japadog which is run by a Japanese guy. 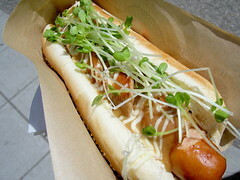 You can choose hot dogs with Teriyaki mayonnaise sauce, Miso mayonnaise sauce, grated radish etc. I tried Miso mayonnaise this time and I wanna try grated radish one next time. Their menu is here. I just tried the TerriMayo a few days ago. Its’ really good! What a unique hot dog stand! I highly recommend it. Thanks for the hours and menu link. ☆Cindy, yeah, Terrimayo looked good! I want to try it next time. It would be interesting if they expand their menu further. I like the teriyaki one over the radish one. 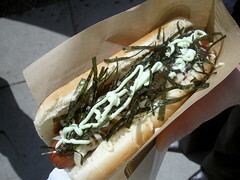 I work within walking distance from them and I crave a Japadog all them but I must resist. 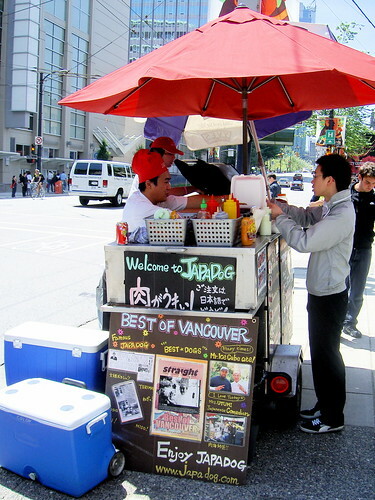 ☆Phil, wow, you are a Japadog addict. I should definitely try teriyaki one then. Thanks for your recommendation!